The fig, native to Asia, is a deciduous tree (Ficus carica) that will grow to heights of from 10 to 30 feet. A distant relative of the mulberry and the bread fruit, figs are prized for their sweet pulp and the nutty flavor of their seeds. 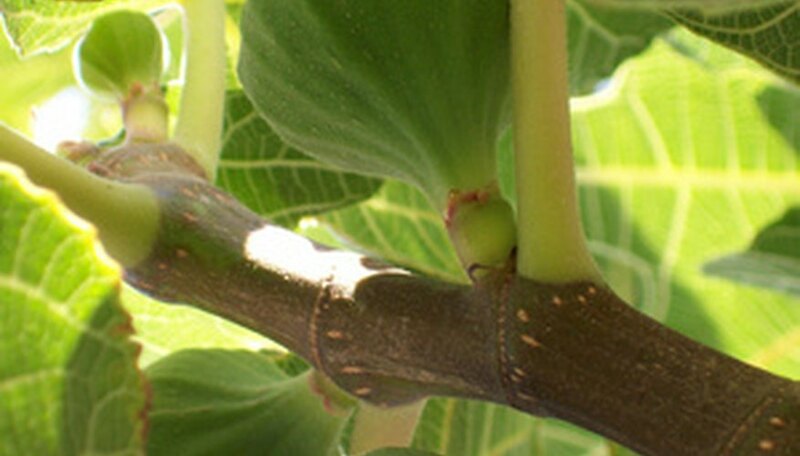 Fig trees thrive in areas with dry, warm climates. The key to successfully growing figs in Georgia is to choose varieties that are well adapted to the different growing zones in the state. Choose a variety of fig to grow that suits your area. According to agriculturists with the University of Georgia Extension, there are only a few varieties that the Georgia gardener should consider. For mountain orchards, choose Celeste or Hardy Chicago. In the Piedmont, you can grow the Celeste, Hardy Chicago and Conadria. South of the fall line, which runs roughly from Columbus to Augusta, it's best to stick with Celeste and Conadria and, for late figs, consider Alma. Ensure that your fig tree is planted in a suitable location. The site must be in sun all day. Also, consider the size of the tree when mature. Fig trees can get quite large and their roots tend to spread out. To avoid disruption of other planting areas, such as flowerbeds, site your tree well away from them. Test the pH of your soil. You can purchase inexpensive soil testing kits at larger gardening centers and nurseries, or take a soil sample to your county cooperative extension office for analysis. You are looking for a soil pH of 5.5 to 6.5. If your soil pH is low, you can raise it by adding dolomitic limestone, according to horticulturists at the University of Georgia Cooperative Extension. If the pH is too high, amend the soil with sulfur. Till, to a depth of 8 inches, a 6-foot by 6-foot area around where you plan on planting the fig tree. Crush any large clumps of soil and remove any rocks, roots or other debris. Spread any soil amendments suggested by the soil analysis (such as the limestone, if needed) over the tilled soil and use the gardening fork to mix them into the soil. Dig a hole 4 inches deeper than the pot in which the fig tree is currently growing, and twice as wide. If you are planting a bare root tree, dig the hole 4 inches deeper than the length of the roots and twice the width of the rootball. Place the roots of the tree into the hole and fill it halfway with soil. Fill the hole with water and, when it drains, completely fill with the remaining soil. Lay down a 3-inch layer of mulch, at least 2 inches from the tree's bark, to help conserve moisture and discourage weeds. Water the young fig tree on a regular schedule until it becomes established. Depending upon how dry the weather is, you may have to water two to three times a week in order to sustain moist, but not soggy soil. The mature fig tree should be watered slowly and deeply every week or two, again depending upon the amount of rain you receive in your area of Georgia. If the leaves begin to turn yellow and drop from the tree, water it. Fertilize the fig tree only if it is being grown in sandy soil. Too much nitrogen will discourage fruit production. If you must fertilize, give the tree 4 applications of 1/4 pound of nitrogen in January, March, May and July. Prune the Georgia fig tree only to remove dead or dying branches. Be especially careful of pruning in the winter as you may trim off wood that will produce the new crop. According to the California Rare Fruit Growers, the fig tree will be productive without pruning. Protect the fig tree in the winter by decreasing the amount of water given. Build a soil berm or barrier to keep snow and other moisture away from the tree. If the tree is not too large, cover it with a tarp, carpet, blanket or some other type of insulation.